Thanksgiving is supposed to be about appreciating the good things in life. That’s a broad idea that is interpreted in deep and personal ways by each and every one of us. For some, it is appreciation of family and home, for the food placed on the table. For the people around the table and the moments they have together. For others, it’s a reflection of those not at the table. For the loved ones we’ve lost and the ones serving overseas. They are not at the table, but we are grateful to them as well. For me, it’s family and friends and everything in between. We celebrate with food, but also with the time we spend together. And for those no longer with us, it’s the memories and stories that get better with time. And then there’s comic books. Yeah, comics. That thing that brings us all together here. The stories, the art, and how it comes together every month. The history, the fandom, the geekdom, and the conventions where we all meet. All of that makes me happy and I am grateful that we have this. But there is something deeper, and it’s worth a moment of appreciation. As a medium, comics provide a type of escapism that is unlike any other medium. That’s because your own voice provides the soundtrack; from the Blam and Pow to the basic thought balloon. It’s not like movies where we hear the same voice.You hear it your way and I hear it mine. The pictures are static, but when you put two or more together in sequence, they create a visual action that we populate in our brain. On the comic page, we imagine action where there is none. Because we are actively involved, we become immersed in the story. When I was lonely, comics were there to make me feel like I was on a superhero team. When my view of the world was forming, comics nourished my mind with stories and ideas that expanded my concepts of time, space, justice, irony, love, hate, and, of course, power. As I get older, comics reflect my own maturity. I seek out complex narratives that explore fresh ideas and adult themes. Comics are as flexible and diverse as the people who read them. No other industry has an open-door policy like comics. Our biggest stars are accessible, generous, and involved with the fan base in astonishing ways. There’s little separation between the eager fan and the accomplished comic professional, both physically and emotionally. We are not an industry of roped-off privileged and elitist separatism. If you desire to contribute to comics, the barriers to entry are quite low. A comic created by one person can look as good as one made by a professional team of creators. The same tools and techniques are accessible to all. You can create a comic from your basement that has production values that are comparable to a mainstream publisher. Happy Thanksgiving. Original art by Tim Sale from the Batman comic books. Graphic adaptation by Grant Shorter for Comic Book School. If you’re reading this, you probably have some level of interest in making comics. Good for you, and if you actually publish your stories, good for all of us. Your basic interest in self-improvement means that at some point you will make a comic that touches someone. Every few months or so, I go to a comic convention and host a panel or educational workshop on creating comics. It’s encouraging and uplifting to see people who take time from their busy lives to get into a room and share ideas and best practices. We get everyone from the top established talent to the hottest new creator to donate their time to the fans. This is amazing when you think about it. In the 20 years that I have been doing conventions, I have never encountered a comic pro that asked for money to participate in a panel or workshop. No, they leave their artist alley table where they could be making money to tell you exactly how to do their job. They are, quite literally, training the people who may be their competition one day. While we’re on the topic of conventions, it’s worth noting the magic moments we get when we gather together at big and small comicons. The stress of the real world melts away, even if for just a few hours, as we immerse ourselves in the stories and characters that enrich our lives. That we can find our tribes and share an experience under one roof is amazing as the stories that we love. So in this reflective moment, I am grateful to the comic stories, the comic pros, the aspiring pros, and the entire industry for what we have created. We are all co-architects of this industry and shape it with our own enthusiasm and passion. We carve our small pieces of this shared universe and make it our own. We do this every month, and since we have such a relentless and rapid schedule, there’s room for many different ideas and interpretations. If the last issue didn’t work, we’ve always got next month to do better. And, of course, I am grateful to you. To the creatives, the visionaries, and the fools who ignored otherwise good advice and made comics — even if making comics makes no sense from a financial perspective. To the ones who daydream in pictures and thought balloons. To the ones who have not given up on themselves and will keep improving their craft until their very last breath. I am grateful to you because of all of these things…and one more. I know that you’re out there making comics. And you won’t quit. And if you don’t quit, I can’t quit either. Quitting is easy. Sticking with it, even after epic failures, is hard. Believe me, I know failure. But when I see the traffic to the website and the subscriptions to the newsletter and the attendance at the conventions, I know that I am not alone. I’m part of something special that includes all of you out there, wherever you are. We are one big virtual studio. When I sit down with my family and friends for Thanksgiving, I will be grateful to them for being part of my life. And, of course, I’ll be grateful for everything that we have in comics. We are very fortunate. Thank you for everything. Happy Thanksgiving. 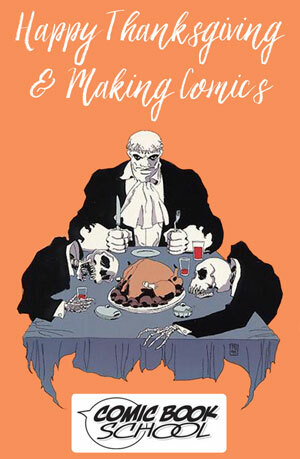 Creative Inspiration from Ze Frank – Go #makecomics!